At least I didn’t have to harvest grapes at night like many of the real vineyard workers when the cold makes the fruit easier to move. 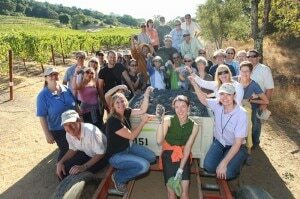 And after picking, most real crews don’t get to refresh with 2005 J Vineyards & Winery Vintage Brut. I am spending my vacation at Sonoma County Grape Camp, which gives wine aficionados and rookies alike a few days of hands-on experience in the wine world from grape picking and stomping to wine pairing and blending. You’ve heard of a Kitchen Makeover, but how about a Kitchen Takeover? Chef Tin Vuong of Abigaile hosts a monthly Kitchen Takeover at his American restaurant in the heart of Hermosa Beach, California, close to the sand. 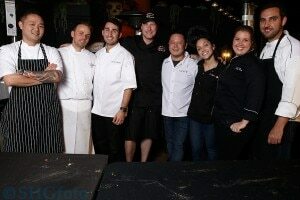 He invites a group of chefs to help him prepare the special menu available for one night only, with each toque preparing a different course. We were lucky enough to attend his last gathering in the historic, rustic building. We made our way past the large vats where the house-brewed beer is made to a large, casual table across from the lively bar. The theme was global cuisine, and it didn’t disappoint. • the simple fact that celebs don’t eat that much or they’ll wind up starring in a Weight Watchers commercial instead of a TV series. Consult our list of the Top 10 Star Spotting Restaurants in LA and you’ll see quality restaurants where you’ll find a good meal even if you don’t spot an Academy Award winner. 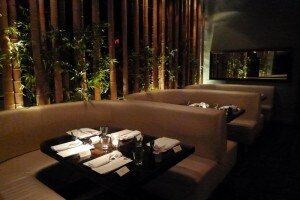 On that list is Koi, which we have been enjoying for more than a decade. EDITOR’S NOTE: Between a fatal bus crash and a manhunt for a revenge-minded cop-turned-copkiller, Big Bear Lake, California, has been in the national news a lot lately. I had the pleasure of visiting the area just before the back-to-back headline-grabbers occurred. As the area struggles to put these episodes behind them, the following innocent tale reflects the type of news Big Bear wants to make. 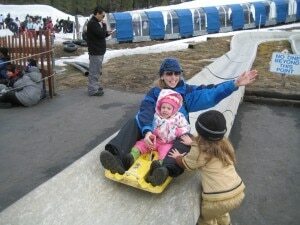 Growing up in sunny Southern California, my daughters are exposed to sand, sea, surf and sun, but not snow. Good thing nature provided Angelenos with nearby mountains so kids can frolic in a geographically desirable winter wonderland. For their first foray into snow, the kids rode up to Big Bear Lake, California, which is taking on child obesity and promoting healthy lifestyles through a new program called KIDS. GET OUTDOORS. WIN. We haven’t bought our turkey yet. Black Friday is still two weeks away. Is it too early to go holiday shopping? 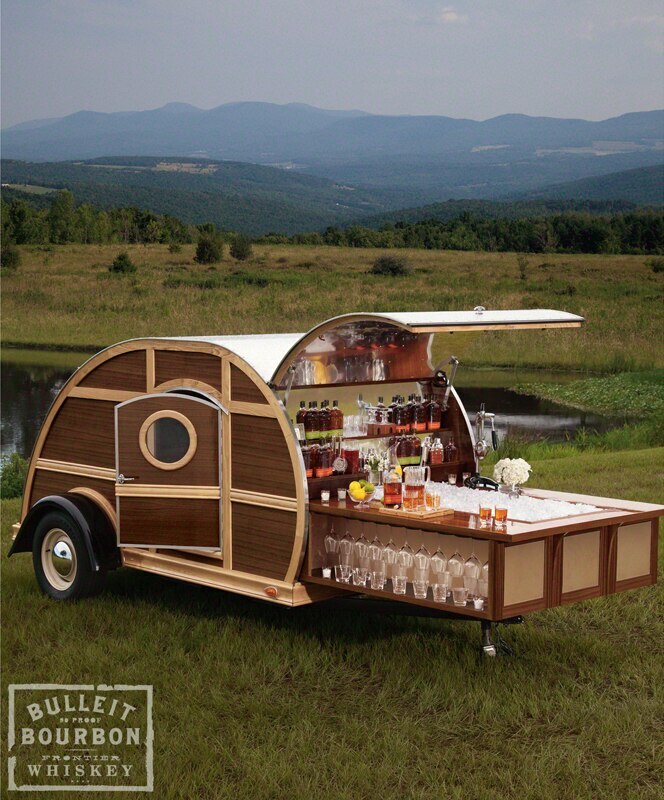 Not if you have your eye on a one-of-a-kind item like the Bulleit Frontier Whiskey Woody-Tailgate Trailer! 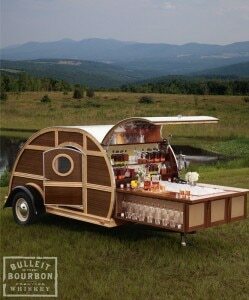 This old-school trailer designed by Brad Ford is the perfect gift for the Bourbon or Rye lover in your life. “I wanted to create something that would express the brand’s unique character, yet would also elevate an activity that all of us are familiar with,” said Ford. Check out the video in which Ford explains his inspiration.